I LOVE my MacBook Air laptop and there’s no way I can see myself going to an all-iPad / all-tablet computing experience tomorrow. I also love my iPad and I love my iPhone. They allow me to do things I couldn’t do with “traditional” computer gear and peripherals. (Exhibit A: 11 teacher-of-the-year videos including interviews with 44 different people, shot, edited and published with my iPad 2 using iMovie in three days.) My iOS devices are still SECONDARY devices to my primary computing tool, however, my LAPTOP. 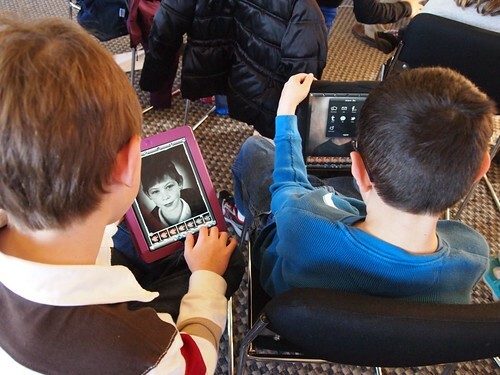 As I shared in my March 21st post & rant, “Let’s Believe in Kids and Teachers as Creative Digital Makers, Not Just Passive Consumers,” I think our kids / students and teacher peers both need and deserve LAPTOPS to become full participants in our 21st century economy and society. Unfortunately, however, we are far from a “critical mass” of teachers, administrators, parents and legislators who believe this and understand this. More people need to watch and really LISTEN to the Code.org video, “What Most Schools Don’t Teach.” This is why I’m passionate about helping kids (and teachers) learn how to create, problem solve and program in Scratch, and why I’m going to keep facilitating Scratch Camps in our community. Currently, at least, you can’t do this kind of coding and programming on a tablet. YET. Simply stated, and there’s no easy way about it, Windows 8 is failure. The measure of how much likely comes when Microsoft announces first-quarter results later this month. Looks like early license sales success is more a factor of low-cost upgrades, which the company no longer offers. Sustainability of license sales, at full price and without much lift from PCs, is something Microsoft must answer with earnings. Share price is down more than 2 percent in after-hours trading tonight, BTW. Accelerating a trend already evident from past quarters, smartphones and tablets pull sales from PCs. Even Apple. IDC asserts that iPad contributed to Mac shipment declines during first quarter. From what I’ve read previously, this VERY recent trend of Apple laptop sales declining is a BIG trend line change. iOS devices have been bringing more people into the Apple fold, away from the “dark side” of Windoze-based computing, but now it appears more consumers than ever purchasing technology in recent months are opting for tablets instead of laptops or desktops. The AppleCare warranty for Phase III of the MLTI ends June 30th, 2013. Here’s my prediction: I think most MLTI teachers will want to stick with laptops as student devices, but I think the “wind of change” is blowing iPad. I predict MLTI will go with iPads for student devices. Will Apple stop producing laptops? Gosh I hope not. Just because sales numbers are declining, I can’t see Apple entirely pulling out of the laptop market. These trend lines are alarming and significant, however, and I’m thinking we may feel their effects sooner rather than later in schools. We’re living in exponential times, right? Faster change is now the norm. The Post-PC age is here. Interesting Mr. Wes. I have been jotting down similar thoughts. I have a two year purchasing plan at Casper College which contains what I believe will the be the last big blocks of PC’s I buy in my life. A portion of this plan includes a 121 unit Chromebook initiative, iPad’s Surface tablets and BYOD. I want to retire 150-200 PCs from an 1800 unit inventory to help us address the April 2014 Windows XP retirement. I have had thoughts about my first opp to buy large blocks of PC’s from Gateway. Good Post. My names Whitney Bizjak and I am a student from the University of South Alabama in Dr. Strange’s EDM310 class. You may or may not remember me from a couple months back, I was assigned to your blog then as well. This post really sparked my interest because I have been having a hard time agreeing with every student having a laptop in the classrooms. So this post was perfect for me because it expanded my knowledge of the possibilities for it. Thank you for all the links and videos you shared. They were a big help and I learned a great deal of the success for the technology in classrooms. As usual, I will be posting a summary of my visit to your blog on the 28th of this month. Not sure what “iPad’s Surface tablets” are. Surface is made by Microsoft; it is not an iPad. And, in fact, despite the fact that surface is a “tablet”, it is actually a PC. It runs full-fledged Windows and can run all programs Windows can run. If people buy Surface (or other Windows 8 tablets/convertibles), they aren’t moving away from PCs. They are simply buying PCs with touch-screens. I’ve seen a lot of articles about “post-PC” world as well, but I will believe it when I see it. Right now, if you were to look at schools and how they are (unfortunately) replacing computers with iPads, you would think we are in a post-PC world. They are simply too limited. Studies have shown the virtual keyboard on tablets to slow down keyboarding, as well as inducing fatigue and frustration when typing documents over 500 words long. And that says nothing of USB (not everything works as Bluetooth, nor should it), peripheral devices, computer programming like you mentioned, and more complex tasks (like 3D modeling/animation/CAD, and HD video production) that require better processors than you are going to find in smartphones and tablets.